Ask fellow campers about "Snake Creek Recreation Area" and nearby attractions. This is my 4th year coming here during October, and it has become one of my favorite parks in the United States. The entire park is beautiful and well-maintained. The bathrooms are the cleanest I've seen in an RV Park (keep in mind that I'm here in October, and there is only one other person in the entire park, so current usage is low). I don't think there's a site in the park that I would consider less than "GOOD" and most I would rank as "EXCELLENT". The rolling hills and views of the Missouri River are beautiful. 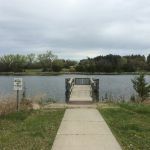 There are several small lakes on the property, and a large beachfront with swimming on the Missouri River. There is usually a nice breeze in October, and I've never encountered any bugs as a result. The sites are paved and most are nicely level. There are no hookups for sewer or water on-site, but there is a dump station and water fill at the entrance to the north loop. I use this as my base for "Hunting Camp", traveling in a 33' RV. There is exceptionally good cellular service for Verizon, and I can see the transmission tower on the hilltop across the river. This makes it exceptionally nice for me, since I work remotely while traveling for the entire month. Note that there is no cable hookup either, and there are no over-the-air TV broadcasts. I am happy not to have the distraction of TV while I'm here, but I will download movies to my iPad for the occasional night of fun. Radio signal is limited to two stations (and I don't care for either one) so I just use Sirius XM. We camped at Snake Creek Recreation Area in a Travel Trailer. Platte is 14 miles east, and has a nice Food Center for groceries/supplies. There is a laundry facility attached to a nearby motel right in town. Propane fills are available in town as well. We loved our campsite. Back of trailer right on the banks of the Missouri River. Quiet. But not many sites in this very nice campground did that. Lots of trees and grass, Generous spacing between sites, helpful staff. Closest town in Platte, about 14 miles away. Verizon worked well, no wifi, sat tv fine. We camped at Snake Creek Recreation Area in a Travel Trailer. Swimming beach in the park. Restaurant across the street. Nothing fancy but we had a good breakfast. This is such a nice park! We love having grass, trees and lots of space around us. The river is a beautiful view, there are plenty of rest rooms, we had no complaints. Our site was even paved. Verizon service was strong here, too. 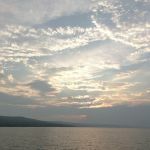 We camped at Snake Creek Recreation Area in a Motorhome. Beautiful spot, would have marked higher but sites only have electricity, but 50/30/20 so that's nice! Great 4G Verizon signal so phones and Internet are great here! We had a nice waterfront site, absolutely beautiful! We were in site 32E not exactly level but with my leveling system it didn't matter. 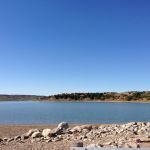 We camped at Snake Creek Recreation Area in a Fifth Wheel. Enjoy the view and the water! We stayed here for 1 night while on our way to Wyoming. We were on the south side. Restrooms are VERY clean, camp host were friendly, view was amazing. Our kids asked to stay and live as they loved it so much! Most certainly a big difference from Eastern campgrounds! We camped at Snake Creek Recreation Area in a Travel Trailer. We were here during the week and were the only ones in the loop for most of the evening. Someone arrived later and set up a couple sites away. Can't blame them - we were in sites on the river with a nice view. I can imagine (hope) this place is busy during the summer and on weekends. It's away from it all and the price is right. Electric only; dump across the highway; good cell/data coverage. Would return if in the area. We camped at Snake Creek Recreation Area in a Travel Trailer. 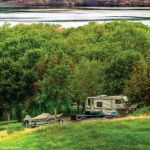 Snake Creek State Recreation Area is a rural campsite with full network coverage, waterfront (Missouri River), full hookups, and not ludicrously priced. When we pulled up, there was only one RV near 15 empty RV spaces and us. Behind our spot, the mighty Missouri River which at this point was behind a dam and a mile wide. Our space had hookups intended for a RV to back-in, but I was not going to a miss an opportunity to sit and look out at the windshield. This campground did not have water or sewer, only electric, which is odd but for two days, it would not be a problem. Voilà, campsite setup! I loved this campground and this location. I would have feel comfortable staying here for two weeks, settling into a slower pace, with a beautiful view. Perhaps in the future, we will stop here for another stay. Would I recommend this park? Absolutely. Would we come back? Absolutely, I am trying to figure out a way to pass through this part of South Dakota again. We camped at Snake Creek Recreation Area in a Motorhome. We camped here in a 40' motorhome with toad in the South campground loop area in site 115. We chose the South campground loop over the North loop because of larger sites with more green space between sites, plus it is a newer addition to the campground. Interior roads and pads were asphalt wide and easy to get the bus around in. Verizon cell and MIFI were marginal and could not get satellite signal because of mountains in southwest direction blocking signal. Electric was strong. No water or sewer at sites, but they have a dump station across the street from the entrance. This campground is quite isolated from any close town, so you need to bring your supplies with you. We would use this campground again for a stop over, but not a destination campground. We camped at Snake Creek Recreation Area in a Motorhome. This has become an annual trip for me and some fishing buddies. We have stayed at Buryanek, Platte Creek, and Snake Creek. Not only is Snake Creek the best one of them in the area, but one of my favorite campgrounds I've EVER stayed at. While it's not the perfect family place, perfect for couples, or a fishing camp. SD state parks have huge sites! Most other states would have two to three times the number of sites in the same park area. You must stay here to believe it. We were lucky enough to get a pair of waterfront sites this past stay. Amazing weekend. Get this...at 5:45 each morning as we were headed to the boat ramp we saw the Park Employees pulling in for work!! At 6am one morning there was a Park person checking the bathrooms...on a Saturday!! Kudos to the SD State Parks program. We camped at Snake Creek Recreation Area in a Truck Camper. Nice campground for a day or two. No water at campsites, and fill stations practically non-existent. One fill station across the highway on the marina road, but has permanently attached hose and right by the dump station. There is a standard pull-up spigot at the bird cleaning station in the north campground where you can use your own hose, but not marked and hard to find. Other than that, nice views and well maintained. South campground is newer with concrete pads vs. gravel. We camped at Snake Creek Recreation Area in a Fifth Wheel. We loved this campground! This is a green oasis beautifully situated right next to the Missouri River. We camped on North side and the sites are large, level paved sites (easily accessible to big-rigs) with fire-pit and bench. Most of the sites have electric (50 amp), views of the river, and nice separation between campers. The grounds are grassy and maintained beautifully with plenty of shade trees. There's flush toilets and showers. Also, central dump station w/ potable water (up the hill opposite the campground). Final bonus is access to swimming in the river at several locations (the river was literally 10 steps from our RV and we went for several dips each day). During the week this place is completely empty, but I gather it fills up on the week-end. We'd definitely come back here! We camped at Snake Creek Recreation Area in a Motorhome. North Campground is older with many mature trees and with some paved and some gravel sites with 30 amp. The South Campground which is newer has all paved sites and 50 amp. Most sites are spacious many with lake views. Limited satellite reception in North Campground, no problem in South Campground. Water to fill tanks was hard to find. Campground is quiet during the week days but very busy on weekends. There are boat ramps and beach swimming. We camped at Snake Creek Recreation Area in a Motorhome. Are you affiliated with Snake Creek Recreation Area ?